You can now personalise NewsFeed experiences, based on client grouping. For instance, if you're offering personal training in different formats (online, offline, hybrid), training clients at different centres (gyms, corporate, etc) or have specialised training plans (fat-loss, nutrition, etc.). The feature is similar to Facebook's "who should see this" feature. 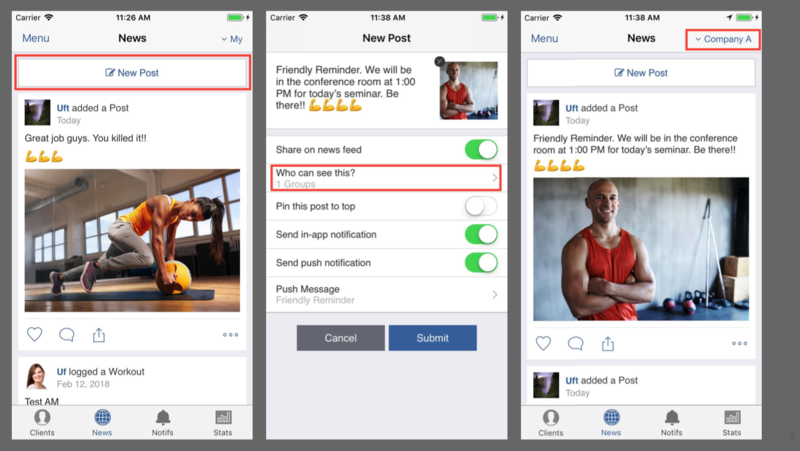 It lets you define who will see your posts, so that you can share personalised fitness advice or tips with each training group. Wondering how it works on TrainerFu? We'll give you a quick overview. Navigate on "News" icon in the main screen, and tap on "New Post". Write the post that you wish to share with your clients, along with a photo. Tap on the option that reads "Who can see this". Select the group(s) with which you wish to share the update. Only the members in the selected group would be able to view the shared update. Lastly, tap on "Submit" to share the post with the selected group(s). You can filter the posts that you shared with different groups by tapping on the "Filter" option on the top-right corner of the news-feed. Pro-tip: By default, all your members would be able to see yours as well as each other's updates on the NewsFeed. If you want to disable members from viewing each other's updates, go to Group --> Edit Settings, and uncheck the option which allows other members to see each other's updates.